My friend Teis and I road-tested the BMW S1000RR 2009 which entered the superbike scene in 2009 and we are in this article comparing it with my Honda CBR1000RR Fireblade 2008. Teis has a Suzuki GSX1300 Hayabusa 2007 which unfortunately was in for service in the days we had the BMW, so there are unfortunately no pictures of the Hayabusa from these days. As the title says we are not testing the S1000RR on race track because we are in no way racing experts. But we both drive several thousand kilometers every year on normal roads on our own superbikes, and it is in this context we will be comparing the bikes. I picked the BMW S1000RR up in the western part of Denmark on a very sunny and warm Friday afternoon. It was a 2009 demonstration model which had been in the ‘kind’ hands of professional bike jurnalists during the first half of 2010, so it had been broken in with 7161 km on the meter, and with little or probably no service att all since brand new. It looked awesome in the sunshine! The rear tire had no chicken stripes, so the bike had clearly been driven by drivers knowing how to get it down. I must admit that my own Honda CBR1000RR Fireblade 2008 model at 19.000 km still has 2 mm chicken stripes on the rear tire, and had it not been for a resent track day at Ring Knutstorp in Sweeden with Mestersvinger (highly recommendable!) there would still have been 15 mm each side . The Blade has behaved flawlessly since new and only received oil service at 12.000 km plus one front tire replacement at 17.500. Hence I guess it is justified to compare the two bikes despite the difference in age and mileage. With some exitement I turned the ignition key and hit the starter switch. It turned over with a remarkably good quality sound from the starter motor and sprang to life in about one second. Here came the first big surprise. I’m used to the very very silent Blade which ‘sounds like a little cat’ when idle, but the BMW immediately growled at me ‘like a lion’, even with no gas on. The sound pattern was excellent, a powerfull but restrained engine, just waiting for gass input. My first guess was that BMW did not have an exhaust gas bypass valve like the Blade has, but later I was proved wrong by BMW’s technical specialist Lars (from Jens Winther Automobiler), who pointed to the front end of the silencer where the BMW indeed has such a valve. It just doesn’t seem to affect the sound pattern much, like it does on the Blade. 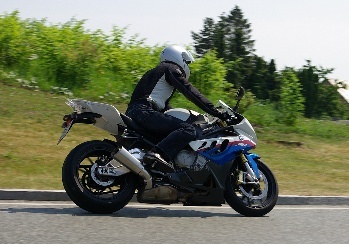 I already new that the drivers position on the BMW was almost identical to that on the Blade, because I tried sitting on the BMW at an exhibition this spring. You really sit in a very relaxed position on both these bikes. There is almost no load on your wrists, so both bikes are good for many hours of driving without getting tired. Teis's Hayabusa is even better in this aspect. At low speeds there is a high load on your wrists, while you seem to be flying completely weightless on the stearing handle at any speed above 130 km/h! – and I litterally mean weightless. There is no force required at all on your wrists, except what is needed to keep the gas on. If you go faster than 130 km/h on the Hayabusa, you just bend your albows a little to find balance between up and down forces – that is amazing! The gas response was smooth like on the Blade, and at the same time very responsive. You get excactly what you ask for, no more no less. And for normal driving in the trafic you of cause don´t need to ask for much. Twisting the gas a few degrees is usually enough, and that is one of the great benefits of these superbikes. Lots of power and low weight. On my starter bike, a Honda CB500 from 2002, I had to twist the gass more than half a turn when making a take-over. Getting on the motorway I could get an impression of the fairings efficiency. There was almost no turbulence to feel anywhere and at any speed. Just as on the Blade there was almost no wind on the hands, and that is an important feature in Denmark, especially if you want to be on the road early or late in the season where temperatures are typically close to 5 degree C. I have heated grips on my Honda CBF1000A where they are indeed needed, but on these two superbikes the lee for the hands is superb so heated grips are not really needed. 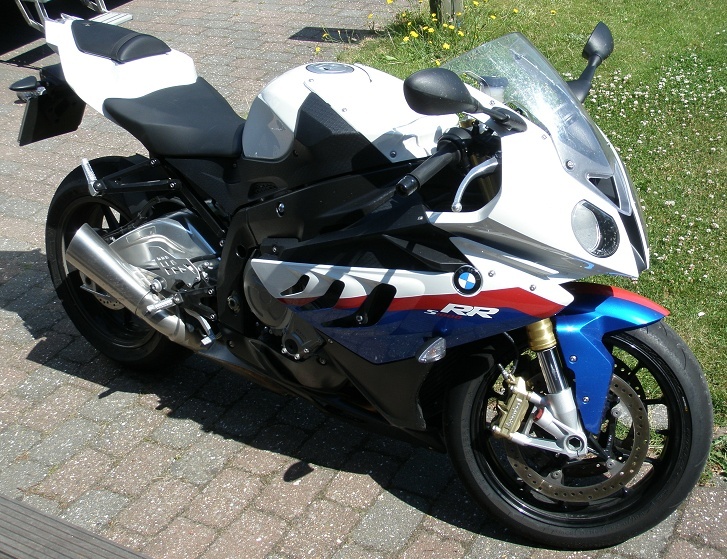 I felt slightly more wind on my arms on the BMW than I’m used to with the Fireblade. Also vibrations in the hands were marginally higher, but on both bikes the vibration level is very low indeed. Soon after, I noticed another difference from the Blade. The BMW got quite hot between my thighs and in my crotch. Much more than I’m used to on the Blade. As I mentioned earlier it was indeed a sunny and unusual warm weekend. The following day Teis noticed the same thing. A couple of times when we made stops, he used a hose with cold running water to cool down the frame metal (it could have something to do whith him driving in shorts only! ).